This week, the rapid pace of session slowed significantly compared to last week. Few legislators were physically on site the first part of the week, and there were no long evening sessions. Having completed most of their work on public bills last week, legislators focused on local bills and several constitutional amendments. Leadership said publicly that the short session will not go past June, so we anticipate adjournment no later than next Friday evening. This week, a House committee debated and approved legislation, Senate Bill 75, which would place a constitutional amendment on the ballot, to cap the maximum tax rate on both personal and corporate income taxes at 5.5 percent. The North Carolina Constitution currently provides for an income tax rate cap of 10 percent. The existing tax rate on personal income is 5.499 percent and it is set to be further reduced to 5.25 percent in 2019. The current tax rate on corporate income is 3 percent, which is set to be reduced to 2.5 percent in 2019. The bill has already passed the Senate and the House Rules committee, and could be heard on the House floor next week. If the General Assembly passes Senate Bill 75, the proposed constitutional amendment will be on the statewide general election ballot on November 6, 2018. In order for it to be enacted, it must be approved by a majority of voters. The NCACC has concerns about potential long-term consequences of this cap. Further limiting state revenue options in the state constitution could potentially shift revenue pressures to the county level. If you have any concerns on how this proposed constitutional amendment could impact your county, we encourage you to contact your legislators. On Thursday afternoon, the Senate Judiciary Committee met to discuss House Bill 551, Strengthening Victims’ Rights. The legislation would place an amendment on the November ballot that would change the section of the state constitution that guarantees certain rights to crime victims and provides additional protections. The proposed changes are inspired by a national movement to enact comprehensive victims’ rights. The initiative, known as “Marsy’s Law”, began in California to address concerns raised by surviving family members of a murder victim. Earlier versions of the proposal guaranteed reasonable protection for the victim from the accused. This was removed from the most recent version after local law enforcement and local governments raised concerns about liability and practicability. During committee discussion, legislators raised questions about the impact the new reporting requirements would have on the court system. The bill was presented for discussion only, and will be heard formally in committee for a vote early next week. In addition, several other proposed constitutional amendments saw action in the General Assembly this week. Each of the following constitutional amendments would be placed on the November 2018 general election ballot if approved in each chamber of the General Assembly by a 3/5 margin. They would then require approval by a majority of North Carolina voters in order to be ratified. Require Photo ID to Vote – House Bill 1092 requires every individual voting in person to present photo identification. Should the amendment be approved by voters, legislators would debate and approve the manner in which the new photo ID requirement would be implemented. The bill has been heard in a House committee and is expected to be voted on by the House early next week before being sent over to the Senate for consideration. Protect Right to Hunt and Fish – Senate Bill 677 provides the people of North Carolina the right to hunt, fish, and harvest wildlife. Under the amendment, the General Assembly could still pass laws regulating hunting and fishing. The proposed amendment also includes language stating the amendment is not to be construed to modify any current provision of law relating to public safety, trespass, property rights, eminent domain, or the regulation of commercial activities. This legislation has passed the Senate and one House committee. It is expected to be voted on by the House early next week. Statewide nominations of candidates are made to the Commission. Commission vets names and submits qualified nominations to General Assembly. 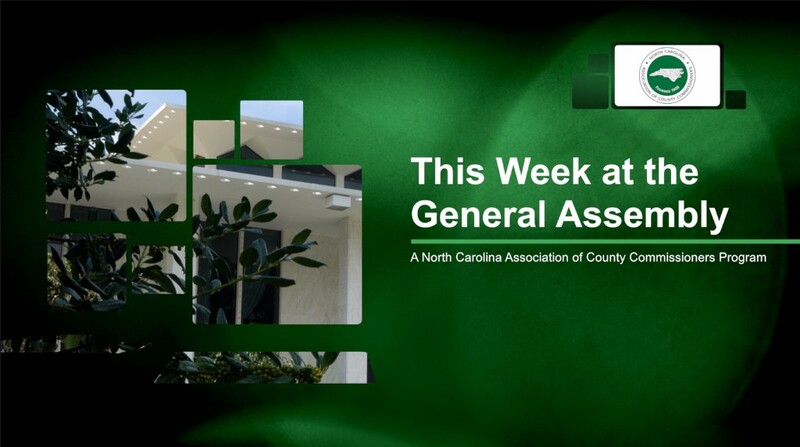 General Assembly must submit at least two nominations to Governor for appointment. If the Governor fails to appoint, the General Assembly decides. If the General Assembly is not in session, the Chief Justice makes the appointment. The bill currently resides in a Senate committee and, though discussed, has not received a vote by that committee. A bill we mentioned in this week’s supplemental brief has not been heard on the House floor as expected. Instead, it was referred back to the House Rules Committee. The most recent version of the legislation - Senate Bill 153 - appeared in the House at the end of last week and contains a handful of provisions of note to counties. Section 2 of the bill sets up a special separation allowance for firefighters and rescue squad workers that could cost local governments $298 million over the next ten years. This analysis is from a legislative retirement note attached to House Bill 340 which is now section 2 of Senate Bill 153. The bill contains other provisions of concern to counties. The expanded commercial cemetery property tax exemption carries a $1 million impact to local governments according to the legislative fiscal analysis. Furthermore, the bill includes a property tax exclusion for the unmarried spouses of fallen first responders that carries a $700,000 impact to local governments across the state. The bill could move out of House Rules this week and on to the House floor. NCACC asks our members to contact their legislators with concerns on this legislation. The bill was ratified and sent to the Governor last week. In a 5-4 decision, the U.S. Supreme Court issued its opinion yesterday in the South Dakota v. Wayfair case, upholding South Dakota’s law that requires out-of-state retailers meeting certain transaction thresholds to collect and remit sales tax. In deciding for the state, the Supreme Court overruled previous decisions prohibiting retailers without a physical presence in a state from collecting sales tax, noting in Wayfair that “physical presence is not necessary to create a substantial nexus.” In response to the decision, the states and Congress could follow a variety of paths. Support for the Marketplace Fairness Act at the federal level is one of the NCACC’s federal legislative goals, and the state legislature could choose to pursue legislation similar to Senate Bill 81, which passed the state Senate last year and addresses sales tax collection for remote sales.